How do I create custom granule prescription? How do I create custom raw herb prescription? 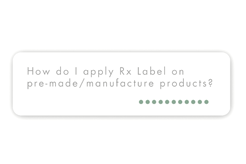 How do I apply Rx Label on pre-made/ manufacture products? 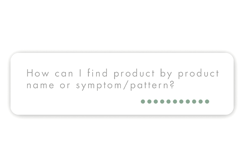 How can I find product by product name or symptom/ pattern? How do I checkout my shopping cart? How do I manage multiple patient order? 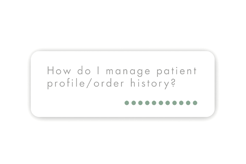 How do I manage patient profile/ order history? What herbs and services are available? Kamwo offers more than 500 raw herbs, more than 1000 granule extracts, and an extensive selection of patent and topical herbal products. We fill custom herb herb orders in raw, vacuum packed, loose granule, or capsule form. Premium bulk raw herbs and granules are available, including Pao Zhi selections. HOW DOES KAMWO ENSURE THE QUALITY & SAFETY OF THEIR HERBS? Kamwo also employs independent US testing facility Eurofins Central Analytical Laboratories, to test our herbs for microbial contaminants, heavy metals (such as Arsenic, Lead, Mercury, and Cadmium), and sulfur, as well as for over 60 pesticide residues, including DDT and BHC. HOW IS MY HERB ORDER FILLED? Kamwo employs fulltime NCCAOM certified Diplomates in Chinese Herbology, as well as a Western pharmacist supervising prescription services. Every raw herb prescription goes through a six point documented safety and quality check before it is dispensed. Kamwo fills granule formulas using our innovative Granule Accuracy Check (GAC) system. This system, including computer software, barcode technology and integrated electronic scale, was specifically designed to address the potential for human error. Each granule formula filled at Kamwo is GAC-ensured to be exact to specification, safe and effective. HOW DOES KAMWO ACQUIRE RAW HERBS THAT ARE HIGH QUALITY & POLLUTANT FREE? Our raw herbs are carefully selected and verified for correct species and geo-authenticity. Upon receipt, each herb must pass inspection for proper identification, maturity, and high quality. Innovative techniques in preservation and packaging ensure a product free from sulfur dioxide fumigation and other preservatives. Every batch is tested for heavy metals, pesticide residues, and microbial contamination. How does Kamwo produce Granule that are High Quality and Pollutant Free? Our Meridian Pro granule herbs are 5:1 concentration, meaning 1 gram of granules is equal to 5 grams of raw herb. All of our granules use a base of gluten free, maltodextrin which is derived from corn. All formulas are cooked together, not singly, to enhance their synergistic functions. During manufacture, volatile oils of the herbs constituents are reintroduced in the final step to create a potent and effective product. Each bottle includes manufacture date and batch number so that all final products can be traced back to their original sources. How does Kamwo produce TeaPills that are High Quality and Pollutant Free? Teapills are valued for their ease of use and patient compliance, enhancing treatment outcomes. Kamwo offers 175 classic formulas in teapill form. Every batch is tested by our GMP-c manufacturer for heavy metals, microbes, and pesticides. Every formula is free from sulfur and preservatives. All results are verified by US independent laboratory testing. All of our Meridian line products exceed GMP standards by including allergen alert information on the label. E-script is the professional services portal for Kamwo Meridian Herbs. E-script allows practitioners to buy professional products, dispense custom herbal formulas for their patients, and purchase premium bulk herbs. E-Script products and services are restricted to verified professional accounts. Professional accounts are granted to licensed professionals in the TCM field (L.Ac., D.Ac., AP, DAOM, etc.) and students actively enrolled in accredited TCM programs. Registration is also open to other licensed medical professionals (M.D/D.O., N.D., R.N.) who can provide proof of relevant training in an accredited TCM program. HOW DO I CREATE A CUSTOM FORMULA? Use the Custom Rx tab on the navigation bar. Choose the form of herbs you want and fill in the ingredients, custom label, patient and pharmacy instructions. Save and name your formulas to load and dispense them again at any time. Add refills to your order for continuity of your patients care. HOW DO SAVE MY FORMULA TEMPLATE? 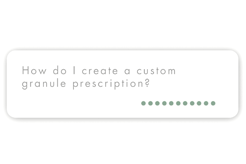 To easily use your preferred formulas over and over, go to the My Formula Templates page under Custom Rx on the main navigation tab. Enter your formula on this page, assign it a name for your reference, and save. Or, go to any previous order and choose Copy. There you will have the option of having that formula saved in the Formula Template area. Anytime you are using the Custom Rx services, you can choose Load My Formula Template to use any of your saved templates. Once loaded, you can still make any modifications you choose. HOW DO I SEARCH PRODUCTS BY SYMPTOM? Use the By Symptom tab on the navigation bar to see the menu of our symptom flow database. Each choice will suggest formulas fitting your symptom, and options to narrow down your choices by pattern diagnosis and form of herbs. Alternately, you can type your term into the search bar. HOW DO I SEARCH PRODUCTS BY FORMULA? If you know the formula you are looking for, simply enter the name into the search bar. HOW DO I SEE TCM PATTERN DIFFERENTIATION? Use the symptom flow under the By Symptom tab. Search results will be separated by pattern diagnosis. HOW TO I PERFORM SIDE BY SIDE DETAILED PRODUCT COMPARISONS? As you shop, click the Compare box underneath a product. You can see a number of products side by side to compare ingredients, indications, manufacturer information, and much more. HOW DO I CREATE A CUSTOM RX LABEL? Some ready made products will have a Create Custom Rx Label option. Choosing this option will give you a pop up where you can enter in all of the custom instructions you wish. Once you have entered your Rx Label information you will be prompted to add the product to the shopping cart. Your label will appear as the sample picture. WHAT IS THE SAVE FOR PATIENT FEATURE? 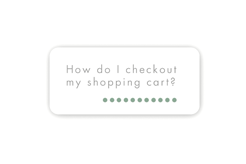 By choosing the Save for Patient option for a product, you will be adding it to the Saved area at the bottom of the checkout page, rather than the shopping cart. You will be prompted to assign it to a patient name. You can move these items to the shopping cart whenever you like, or leave them there until a later shopping experience. Choosing Save for Patient allows you to divide your check out amongst different patients, or ship by different methods. See Multiple Patient Orders below for more applications. HOW DO I CHECK OUT MULTIPLE PATIENT ORDERS IN ONE SHOPPING EXPERIENCE? At check out, your saved products will at the bottom of the page. Move them to the shopping cart and check out for one patient. After successful checkout, return to the checkout page to move more into your cart and checkout for another. Items that you leave in the saved area will remain there until deleted or purchased. If you would like to have multiple patient orders sent to the same place (like your office), use the Saved function to check them out separately and choose Multiple Orders for your shipping option on each one. You will be prompted on how to bundle them to be shipped to one address. IS THERE A DIFFERENCE BETWEEN STUDENT AND PROFESSIONAL ACCOUNTS? The same discounts and services are available to students and licensed professionals. Student accounts are tagged in our system so we can uphold safety and offer more assistance where needed. E-Script pricing levels serve to accommodate the various ways professionals choose to run their practice. The Patient Pay Price is the retail price. It does not include any markup or service charges. Use when you want the patient to pay and are not adding a markup. The Patient Pay with Markup Price is retail price + markup + processing fee.Use when you want the patient to pay and you use the markup system. The Practitioner Pay Price is the professional price. Use when you purchase office items or you collect payment from the patient yourself. If you do not use Markup, you will see that base pricing on the product listings, but your choices at checkout will be Practitioner Pay or Patient Pay (retail only). If you have set Markup information for a patient, then you will see all three payment options at checkout. Choose the one you prefer for that order. HOW DO I ORDER STOCK FOR MY OFFICE? The information you provide on your registration application is used to create a professional account. This account will always appear at the top when you search your Patient Profiles. At checkout, your shopping cart is defaulted to be applied to your office account unless you choose to change it to checkout for a patient. Choose Practitioner Pay to receive professional pricing and apply your payment and shipping options. Bulk discounts, coupons, and free shipping will only apply to orders on your professional account. Yes. We offer bulk discounts on various product lines. These discounts will be itemized on the checkout page. Please note that bulk discounts do not apply to orders sent directly to patients. Meridian Remedies and Singles: 7 units or more receive an additional 0.50 off per unit. Zheng Gu Tui Na: 10% off orders of $300 or more. Seirin: 10 units or more receive an additional 0.75 off per unit. MAC: 10 units or more receive an additional 0.45 off per unit. Shen Men: Mix and match always buy one get one free with a minimum of 2 units. Free Shipping: Free shipping is available on qualifying orders of $180 or more. Please note select products such as heat lamps, disposable table paper, custom herb orders, and orders sent directly to patients do not qualify for free shipping. If your order qualifies for free shipping but contains an item that prevents us from offering it, you will be given a notice at checkout and have the choice of purchasing that item separately in order to receive the free shipping. Coupons: Kamwo distributes coupons for E-Script at events and for various promotional campaigns. Please enter the code in the Coupon Code field at checkout and the amount will be deducted from your order total. Coupons are not applicable for orders sent directly to patients. WHAT IS THE Rx MARKUP SERVICE? Using the Markup feature allows you to add an additional fee to any orders for your patients. Some practitioners use the Markup feature to charge a small processing fee for their time spent placing custom orders. Others use it to charge for their full consultation fee. HOW DO I START USING Rx MARKUP? Go to Patient Profile/Orders under the Patient tab on the navigation menu. Choose Update and you will see all of the Patient Profile information. At the bottom of this page is the option to add Markup amounts. You can add Markup by dollar amount or percentage. Markup information for each order will be itemized at checkout. HOW DO I CLAIM MY MARKUP CHECK? Kamwo mails each practitioner a check for their Markup amount every month. In advance of receiving your first check, a W-9 Form must be submitted to our Accounting Dept. either by fax (212-226-4717) or email at accounting@kamwo.com. Your check will not be mailed until this form has been provided. For practitioners whose accounts generate $600 or more in Markups for any given calendar year, Kamwo will provide a Form 1099-MISC. HOW IS PATIENT INFORMATION SECURED? Kamwo's E-Script is a secure platform to place orders and store sensitive patient information. We make all efforts to maintain HIPAA compliance. See the Electronic Medical Records Tab for detailed information on our security features. HOW DO I SEE PATIENT ACCOUNTS/ORDER HISTORY? Use the Account tab on the navigation bar and go to Patient Profile/Orders. Choose the View Orders tab next to the patients name to see their complete order history. HOW CAN I SAFELY PRESCRIBE FOR PATIENTS WITH ALLERGIES? You can save detailed allergy information on your patients account. The system will not allow you to checkout Kamwo House Brand Products of Meridian Pro and Meridian Classic that contains an allergen you have flagged for a particular patient. Currently, we cover allergen ingredients Animal Derivatives, Gluten, Latex, Tree Nuts/Seeds, Wheat, Shellfish, and Soy in all forms of herbal products. Please note allergen information for products made by other manufacturers is limited to label and product information provided by that manufacturer. HOW DOES KAMWO ENSURE SAFE HERB DOSAGE? Therapeutic dosage ranges for every herb are included in the E-Script database. Entering a dose for any herb outside of the classically accepted dosage range will trigger an alert to notify you of the recommended dose. Our Herb Guide is always available for reference on single herbs and formulas by clicking the icon in the upper right. Ready made products include dosing instructions on the label. Please be aware that the same product across different manufacturers may have different dosage recommendations or frequency. HOW DOES KAMWO HANDLE ALLERGENS IN REGARDS TO OTHER MANUFACTURERS PRODUCTS? Kamwo makes all efforts to be transparent with information regarding products that we carry. We only offer products from other manufacturers that maintain high testing standards and quality assurance parameters. Allergen information is restricted to the information proved by a given manufacturer on their labeling. When choosing products for patients with allergies please read labels carefully and contact us with any questions. Kamwo tries to ensure all label information is up to date by contacting outside manufacturers directly during the first quarter of every year to inquire about any possible ingredient changes that could have been missed. WHAT IS THE E-SCRIPT EMR TOOL? The E-Script EMR tool is a secure platform to store your treatment notes and other patient information. WHAT FEATURES DOES THE EMR TOOL OFFER? Store your patient history and SOAP notes. Upload files, pictures, and video. When using a tablet or a phone, you can take a photo and it will immediately upload into the notes for your patient. Go to patient notes, click on the photo icon, and you will be prompted to "Take a photo". Once you have, the photo will upload into the notes. Use a free form field, use provided standard health form templates, or create your own templates. Patient order history is integrated with their notes so you can easily reference the most recent Rx for your patient. Set your appointment schedule with the calendar feature. WHO HAS ACCESS TO MY PATIENT INFORMATION? Only you have access to your patient notes on E-Script. Admin accounts cannot see patient notes or other EMR information. HOW IS THE EMR TOOL SECURED? Kamwo takes all necessary steps to maintain HIPAA compliance and keep your sensitive information secure. E-Script is password protected with automatic log off to protect you on shared computers. Admin accounts cannot access your patient notes on E-Script. Information is secured between you and our server using SSL AES-256 bit encryption, the same high level encryption used by hospital EMR services. Kamwo uses GeoTrust Inc. as a Secure Server Certification Authority. Our servers are physically and electronically secure, and protected against unauthorized access by a firewall. All entries on the EMR tool are timestamped. A copy of every edit is saved and timestamped. These previous versions of your files are not accessible to the user but are retained for forensics purposes. The E-Script EMR tool is always free! Any practitioner with an E-Script account can use the EMR tool and there is no purchase necessary. WHAT IS KAMWO MERIDIAN HERBS? Kamwo Meridian Herbs is the oldest and largest herbal dispensary on the East Coast. Operating in New York since 1973, we offer complete professional services for TCM practitioners and natural wellness options for the general public. WHO RUNS KAMWO MERIDIAN HERBS? Kamwo Meridian Herbs was founded by the Leung family, who have been Chinese herbal practitioners for four generations. Operations at Kamwo are headed by founder Dr.Carl Shan Leung and CEO Thomas Leung. Dr.Carl Shan Leung is a TCM practitioner trained in China with over 40 years of research and clinical practice in treating dermatological conditions with Chinese herbs. Thomas Leung is a TCM practitioner trained in the U.S., a Western Pharmacist, and is on faculty at Pacific College of Oriental Medicine in New York teaching Herbology. Kamwo employs full time NCCAOM certified Herbalists to fill your order, uphold quality control, and to perform Pao Zhi and herb grinding duties. WHERE ARE YOU LOCATED AND WHAT ARE THE RETAIL HOURS? Our retail location is open 7 days a week from 10 am to 7 pm EST. Orders are shipped by USPS and UPS Monday- Friday 10a-5p EST. Please be aware that there is no UPS pick up on weekends and major holidays. Messenger service is available for orders within Manhattan only. Messenger hours are Monday-Friday 10a-5p EST and limited service on Saturday mornings.